Okay, I had to try these No Sugar Oat Drops from Blueberry Girl via Chef Cru and I’m so glad I did. Ingenious! No sugar. No eggs. No flour. No butter. Can’t really call them cookies like we’ve been saying around here. Nothing in this world can replace eggs, sugar and flour and butter and call it a cookie. Sorry. I’m posting this recipe to remember for next year’s Daniel Fast or for a quick healthy breakfast. It’s a keeper. Now if only my college kid can remember to grab them on the run in the morning. Preheat oven to 350 degrees Fahrenheit. Line baking sheet with parchment paper. Directions: In a large bowl, combine rolled oats, almond meal, mixed nuts, and coconut flakes. Stir in allspice and cinnamon. Add dried fruit and stir until well and evenly mixed. Make sure the dried fruit does not stick together in big batches. In another bowl, combine canola oil, mashed bananas and vanilla extract. Pour wet ingredients over dry ingredients and stir until well combined. Take a 2-1/2 inch cookie cutter and press a tablespoon of the batter into it. Remove cookie cutter. Bake at 350 degrees for about 20 minutes or until edges are golden brown. Makes 2 dozen. Sometimes oatmeal can get, well…kinda boring. I couldn’t imagine serving a big blob of oatmeal for a bunch of ladies at my church’s annual women’s conference last year; I needed something fresh, but didn’t have a clue of what to do. Lord, guide my steps; these ladies are hungry, lol! So, I began to search and I found baked oatmeal. Steel oats…what are those? Soak the oats overnight and then the next morning mix all the ingredients – doesn’t sound hard and the results are a fancy oatmeal that’s baked, sliced into squares, and not a blob. Sounds great! It was so yummy, even some of the ladies asked for the recipe – now that’s always a good sign. 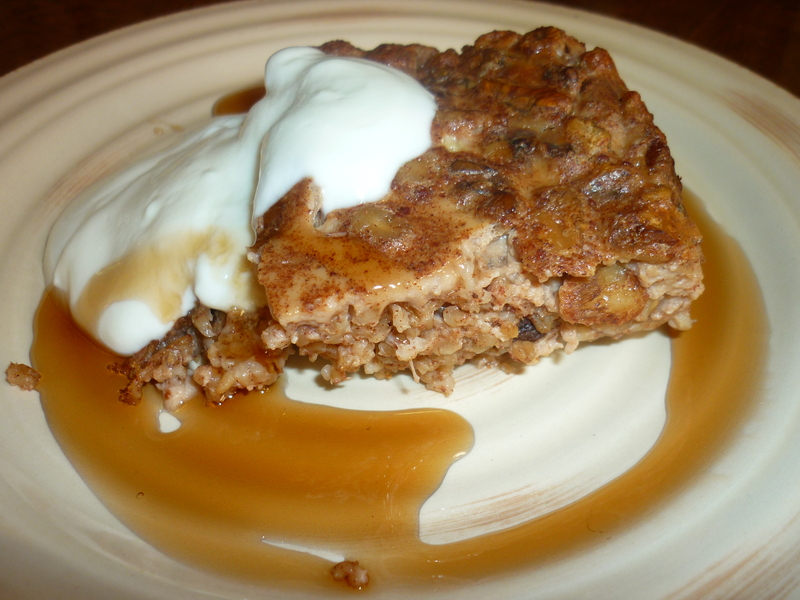 Baked oatmeal is economical and nutritious, and satisfying. You can change it up in so many ways. You can substitute with any kind of fruit – try dried cranberry instead of apricots, pecans instead of walnuts. You could even try toasting the nuts and add it to the mixture before baking, rather than soaking it overnight with the oats. It’s really versatile. I hope you try this! 1. Pour the steel cut oats and nuts into a ceramic container or mixing bowl. 2. Add enough water to completely submerge your oats. Add a dash of salt and 2 tablespoons of fresh yogurt or buttermilk. 3. Allow the oats and nuts to soak, covered, overnight in a warm place in your kitchen- about 8 to 12 hours. 4. After the mixture of oats and nuts has soaked overnight, dump them into a colander to drain and place the mixture back into the container or mixing bowl. 5. Preheat the oven to 375 degrees Fahrenheit and grease a 13 x 9 inch rectangular baking pan with butter or nonstick spray. 6. Meanwhile, beat together eggs, milk and brown sugar, stirring until well combined. 7. Pour the egg mixture into the soaked oats and nuts, stirring well to combine into a porridge-like mixture. 8. Gently fold in raisins and apricots, applesauce, cinnamon and oil into the porridge-like mixture. 9. Pour the mixture into a greased baking pan and smooth it out with a rubber spatula to ensure even baking and a good appearance. 10. Bake in an oven preheated to 375 degrees Fahrenheit for 40 to 45 minutes or until the oatmeal achieves a golden-brown color on top, a knife inserted into its center comes out clean and free from liquid, and the fragrance of baked oats and cinnamon perfumes your kitchen. 11. Allow the baked oatmeal to cool for 5 to 10 minutes before cutting into squares and serving.